Typical 18 wheeler truck used for US goods distribution network. 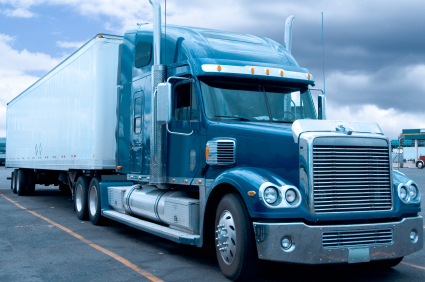 18 wheeler trucks get about 4 miles to a gallon of diesel, (about 3.785 litres). Like most new drivers I tried to get the fuel bonus. I shut the truck down and froze at night, (putting anti-gel in the tank to make sure I could start up again), shut down to go take a shower, and did whatever I could to use less fuel. (One guy would shut down and coast down hills – an extraordinarily bad idea). And like nearly all drivers, I didn’t get the bonus. I thought I would get a percentage of the fuel saved but only the top 3 drivers got a small check for their efforts. A lot of drivers I spoke to said they let the trucks run 24/7 after that. In the State of New York there were idling laws for noise pollution when I was a driver – no truck could remain idling for more than ten minutes. (I assume they let you keep your heat on in the winter). Now under the hood there’s a lot of room – I was surprised. I wrote to a local government official and informed him that he could cut down on pollution and stimulate the economy at the same time with a small diesel generator in 18 wheeler trucks. Then just start enforcing the no-idling laws – that will bring in money for the state. And when trucks from other states enter New York they’ll need to have the generator too – then the whole country will get them. People will have jobs, fuel consumption and pollution is reduced, noise is reduced, and we’ve got a better cleaner planet. He forwarded the proposal to someone in the Department of Transportation and nothing else came of it to my knowledge. We’re not all geniuses and scientists, but we do what we can. If someone is unconscious on the railroad tracks, you pull them off if the train is coming. If there’s an accident, you call an ambulance. It’s easy enough to do the little things. Maybe if we all say it enough, write enough letters, and make enough noise, someone will finally do the right thing. There are solutions to the world’s problems, but the biggest one seems to be: nobody cares. Author of “Lost from Atlantis, Book 1” – to be released on Amazon Kindle in September of 2015. Follow David on Facebook by joining the “Lost from Atlantis” page.